According to the University of Vermont, where they know a thing or two about maple syrup, the first written account of “sugaring” of maple sap in North America dates back to 1557. 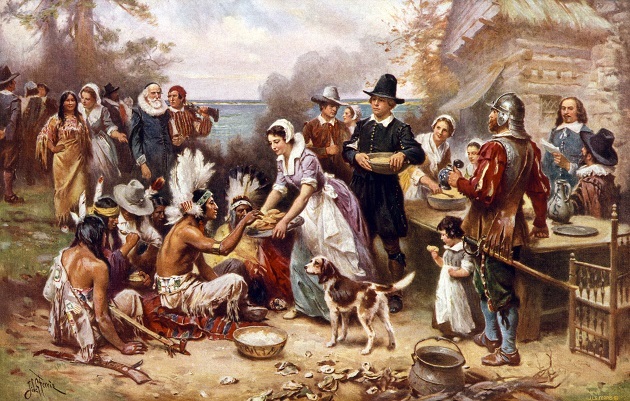 So it’s entirely possible that maple syrup made an appearance at the first Thanksgiving in 1621 as the Eastern Woodland Indians, some of whom attended the three-day feast, were acquainted with this sweet elixir. Its natural affinity for the foods of early winter make maple syrup deserving of a place on your Thanksgiving table. Let’s start with the centerpiece of the feast. If you’ve been haunting the internet and chat rooms or obsessively going through magazines and cookbooks looking for the ultimate Thanksgiving turkey, relax: Your search is over. 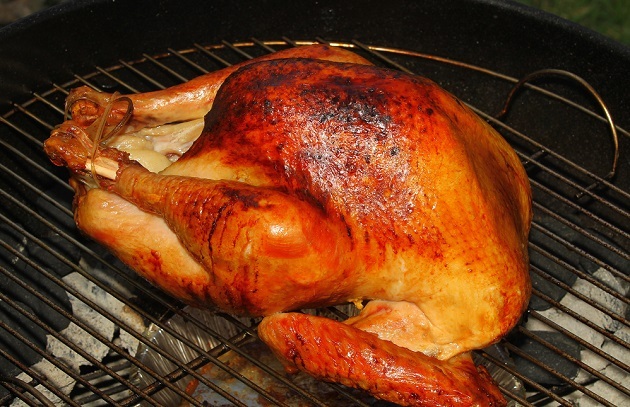 One of the most popular recipes ever on our website, www.barbecuebible.com, is Maple-and Bourbon-Brined Smoke-Roasted Turkey, originally published in Steven’s magnum opus, BBQ USA. This bird, brined for flavor and succulence and beautifully burnished with maple syrup and wood smoke, will trigger a tsunami of compliments. And because more is sometimes more, I like to glaze the bird toward the end of the cook with equal parts of maple syrup and melted butter with a generous splash of bourbon for good measure. Another great (and easy) holiday appetizer is grilled maple candied bacon. Simply brush bacon slices (thick- or thin-cut, your choice) with maple syrup and crust with brown sugar. Then indirect grill over medium-high heat for 15 to 25 minutes—the time will depend on the thickness of the bacon—until the bacon is cooked; it will crisp up as it cools. Transfer to a platter or serve upright in an attractive container and watch it disappear. In the unlikely event there are a few pieces left, use them as cocktail stirrers in bourbon- or whiskey-based drinks. Until fairly recently, maple syrup was sold in three grades: A, B, and C, with A being the lightest colored and most subtle in terms of maple flavor. Now, confusingly, maple syrup comes in four grades, all of them A, but with wordy color descriptions. We prefer what’s known as “Amber Color,” formerly Grade B, as it has a more robust flavor that pairs well with and isn’t overwhelmed by wood smoke. Speaking of maple syrup and wood smoke, Steven often smokes maple syrup that will be used on meat or vegetables. You have plenty of time to make some before next Thursday. Here’s how: Pour maple syrup into a baking dish to a shallow depth, 1/2 to 1 inch. Set up your grill for smoking if you don’t own a dedicated smoker. (A handheld smoker or stovetop smoker can also be used.) Arrange the baking dish on the grate and place a handful of soaked wood chips (drained) on each pile of coals. Smoke the syrup for about 1 hour, then transfer to a lidded container, preferably sterilized. Use the smoked maple syrup to make maple butter for cornbread or sweet potatoes; glaze root vegetables; blend with apple cider and use to baste pork; or drizzle over pumpkin pie or maple ice cream. It makes a terrific hostess gift, too. • The syrups Steven received for his birthday—they do make fantastic gifts—came from Runamok in Cambridge, Vermont. They come in a range of flavors and can be infused, barrel-aged, or smoked. Sold individually or in gift boxes, these syrups are supported by a web page with innovative recipes. The cocktails were especially intriguing. • Another bourbon barrel-aged maple syrup Steven is enamored of is from Quebec, 1769 Distillery. Familiar with Steven because of the grilling shows he shoots in Canada, the company graciously sent Steven a bottle to test drive. • A sentimental favorite is Pure Vermont Maple Syrup, from the family of Jonathan Nichols, the talented longtime jib operator on Steven’s television shows, including Project Smoke. Have a favorite recipe that calls for some great maple syrup? Going to spice up your Thanksgiving with any of the recipes above? Tell us about it! Leave a comment or share your photos with us below or on Facebook, Twitter, and Instagram.